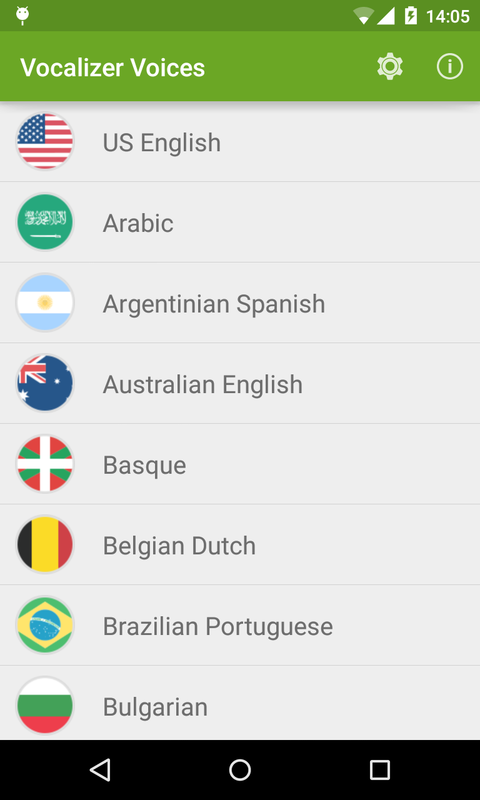 Natural and expressive Text to Speech for Android in over 50 languages. US English, Australian English, Indian English, Irish English, South African English, Scottish English, UK English, Argentinian Spanish, Castilian Spanish, Chilean Spanish, Colombian Spanish, Mexican Spanish, Arabic, Bengali, Bhojpuri, Catalan, Croatian, Basque, Galician, Dutch, Belgian Dutch, Kannada, Portuguese, Brazilian Portuguese, Bulgarian, French, Canadian French, Cantonese (Hong Kong), Mandarin, Mandarin Taiwanese, Czech, Danish, Finnish, German, Greek, Hebrew, Hindi, Hungarian, Indonesian, Malay, Italian, Japanese, Korean, Marathi, Norwegian, Polish, Romanian, Russian, Slovak, Swedish, Thai, Tamil, Telugu, Turkish, Ukrainian, Valencian. Vocalizer Text to Speech for Android enriches the user experience of a variety of applications on your device such as GPS navigation, E-Book reading and Assistive software. IMPORTANT NOTE: Recent Google apps updates force using their own voices. Apps like Google Maps or Google Now, ignore text-to-speech settings, only allowing Google TTS. This decision from Google has been strongly discouraged by the Android community but as for now, we cannot ensure compatibility for this apps. As an alternative for Google Maps, you can use Vocalizer voices on other GPS apps like “Navigator” or “Sygic”, that are compatible with Google Speech APIs. Each voice can be purchased through a simple In-App purchase process. App includes a 7 days trial to test voices. 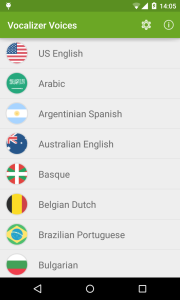 – Supports over 120 voices in over 50 different languages. 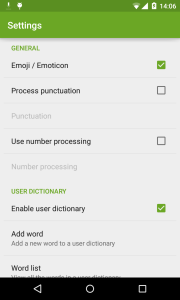 Once the application is installed on your device, you can make Vocalizer your default Text-to-Speech for Androd engine by going to Settings > Language & input > Text-to-Speech output and checking “Vocalizer TTS” as your default engine.